I sold maybe two copies of my novel Replica in July, while charging a measly $4.99. We dropped the price to $0.00 a couple of days ago. The result? 800 downloads on Amazon (I don’t have any data on Barnes & Noble). I don’t have any great insight to offer. People like free stuff. I just hope that some of those 800 folks read the book, like it, and leave me a nice review. And, maybe, buy one of my other fine novels. This entry was posted in Ebooks and tagged ebooks, free books, novels, writing by Richard Bowker. Bookmark the permalink. Maybe you’ll make it up in volume. Well, hopefully it will lead to a lot of great exposure. The more popular you become, the more people will be willing to pay for your work. I am still an unknown author, so I’m thinking about self publishing my first book and give it away for free just to get my name out there. Thanks, Kendi. Good luck! One idea: Start by charging for your book, then cut the price and offer it for free, so that it looks like it’s on sale. That’s actually the only way you can get it to be free on Amazon. Amazon won’t let you set a price of “free” directly; but it will match a free price on Barnes & Noble. Oh okay, thanks for the tip! Good Luck to you as well! FWIW, I got Dover Beach free some time ago on my Nook. Read it last week. 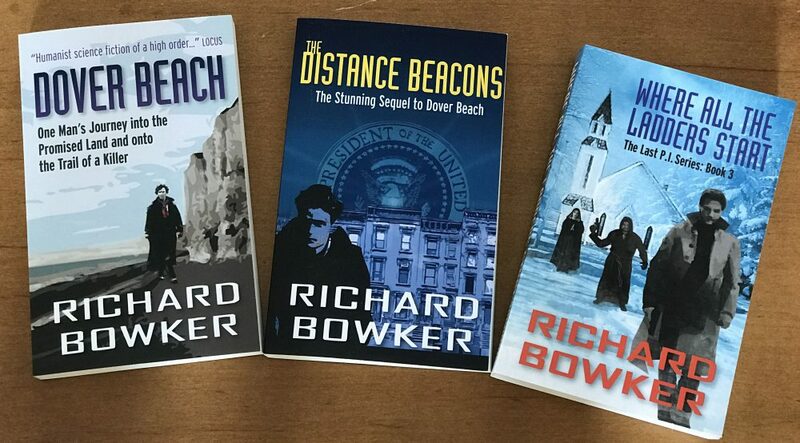 Soon as it was done I bought The Distance Beacons – and wished there were more in the series… I suspect I’ll be working my way through the rest of your books too. Thanks, Richard! Do me a favor and leave customer reviews, if you have the time. The next book in the series is this close to being finished. Stop by the blog occasionally and you’ll find out when it’s available. Left one this evening for Distance Beacons on bn.com I’ll get to Dover Beach soon. Glad to hear another one is coming! Much appreciated! Stop by the blog for progress reports on the new novel.